With its large landscape Dong Phayayen forest could be another potential stronghold for tigers in mainland Southeast Asia and with its relatively high prey abundance long-term conservation can be expected, unlike the neighboring Khao Yai National Park where the loss of tiger was also caused by the declined prey abundance, especially large ungulate such as guar and sambar. 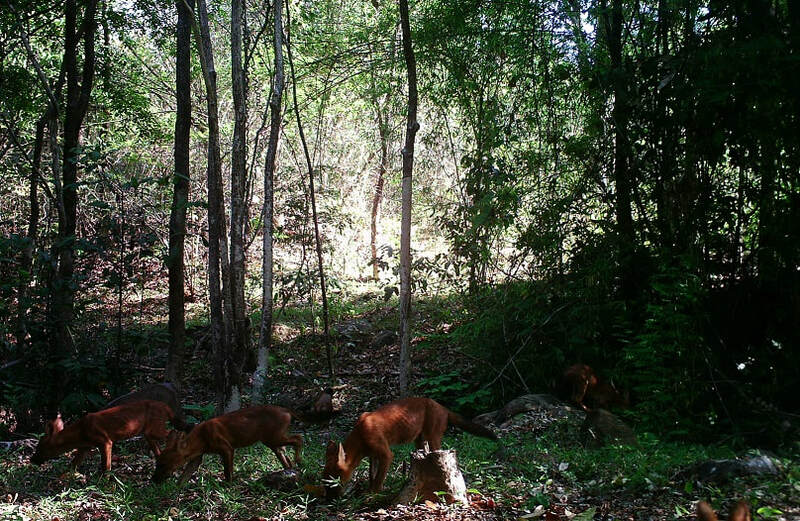 However, this result was likely reversed for dhole, which showed higher occupancy in Khao Yai, mostly due to the lack of competition from tigers. It is encouraging that tigers and dholes continue to persist despite the relatively high level of illegal human activity in and around this complex. The important structural features and food availability found in old plantation forest make it particularly important habitat for Bengal slow loris (Nycticebus bengalensis). 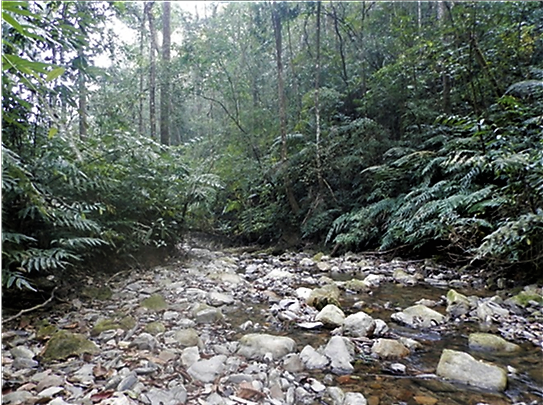 Distance sampling conducted in small patches of protected forest in north-eastern and eastern Thailand, show higher density estimates in old plantation forests compared to natural evergreen forests, both at Sakaerat Biosphere Reserve (27 vs 17 loris/km2) and Khao Aung Rue Nai Wildlife Sanctuary (4.26 vs 4.00 loris/km2). Botanical surveys revealed that plantation forests were associated with higher food availability and fewer nocturnal arboreal species. However, habitat quality of plantation is strongly dependent on its maturity. In the long-term, reduced longevity of exotic tree species may limit the conservation importance of plantation forest, merely acting as a short-term alternative to natural habitat. In the deciduous dipterocarp forest of Eastern Plains Landscape of Cambodia waterholes appeared highly important in supporting globally threatened species, especially large grazers, which are critical for maintaining in the long-term these dry forest ecosystems. Particularly important are the waterholes further from villages, more frequently used, than those nearer. Camera-traps were used to study the utilization of waterholes by 6 globally threatened species Banteng Bos javanicus and Eld’s deer Rucervus eldii, Giant ibis Thaumatibis gigantea, Green peafowl Pavo muticus, Lesser adjutant Leptoptilos javanicus and Woolly-necked stork Ciconia episcopus during the dry season. Pool size, depth, area of the waterholes and number of vicinity waterholes and anthropogenic factors (i.e, distance to village, distance to road, number of illegal activities vicinity to camera-trapped waterholes) were measured. 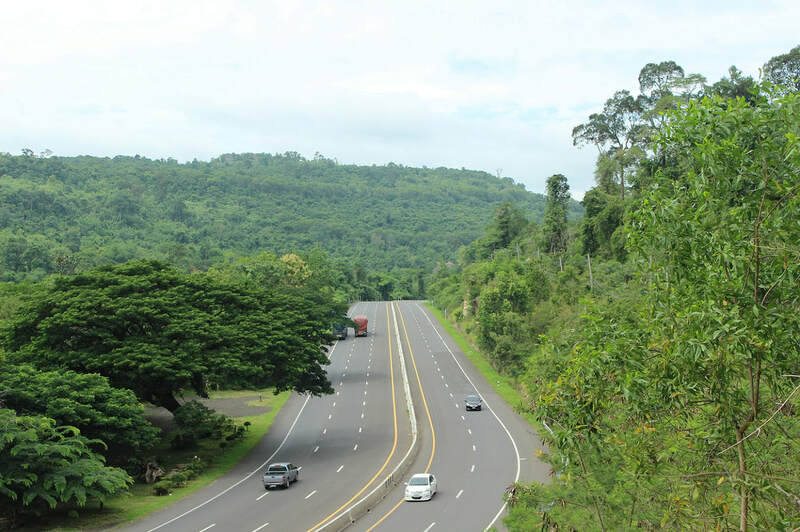 Changes in forest vegetation structure and high traffic volume/noise adjacent to a 5- lane highway (Route 304), a road which runs between three protected areas in northeastern Thailand, had negative effects on most bird guilds. Furthermore, the top three nest predators, Northern Pig-tailed Macaque (Macaca leonina), Green Cat Snake (Boiga cyanea) and Crested Goshawk (Accipiter trivirgratus) also appeared to avoid edge areas. Common Green Magpie (Cissa chinensis), the fourth-most important predator, was more abundant near the edge. The relatively lower predation pressure near the forest-road edge was associated with higher nest survival rates for natural open-cup nests and natural nests in both natural and artificial cavities, as well as higher post-fledgling survival of White-rumped Shama (Kittacincla malabarica). Germain’s swiftlet (Aerodramus inexpectatus germani) nests are farmed in Southeast Asia and generate >US $1.6 billion per year, but their ecology is poorly known. We examined swiftlet foraging habitat selection, described daily and seasonal variation in habitat use, and impacts of rainfall on timing of breeding. Highest foraging intensity occurred over water bodies, forest, and open paddy land; all of which contained relatively higher insect prey numbers. Onset of breeding was explained by rainfall and food availability and there was synchrony between nestling feeding periods and peaks in insect biomass. To minimize negative impacts of nest harvest, timing of harvesting should consider local rainfall patterns. 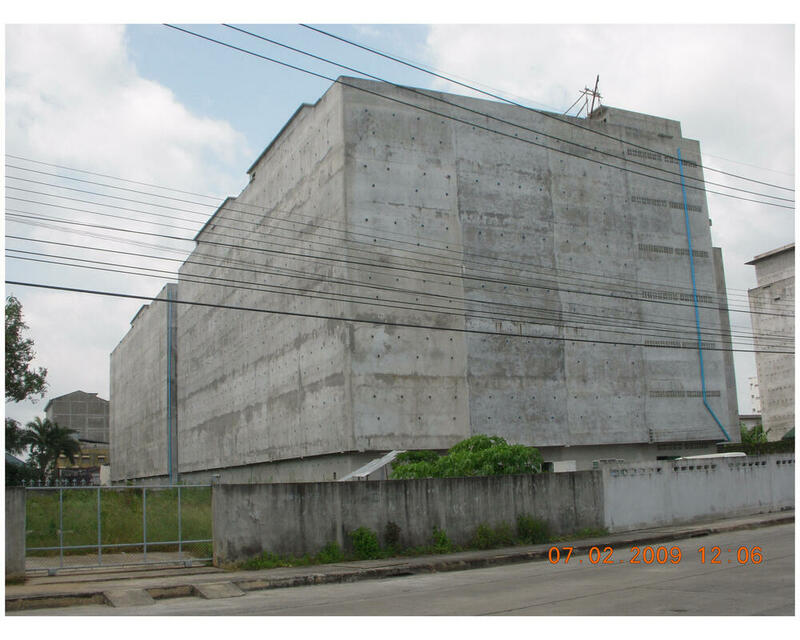 Furthermore, swiftlet farmers should pay greater attention to habitat management around swiftlet colonies to maintain insect prey. View of Chiew Larn reservoir, showing flooded lowland habitat and loss of the upper canopy forest layer. Credit: G. Irving 2016. 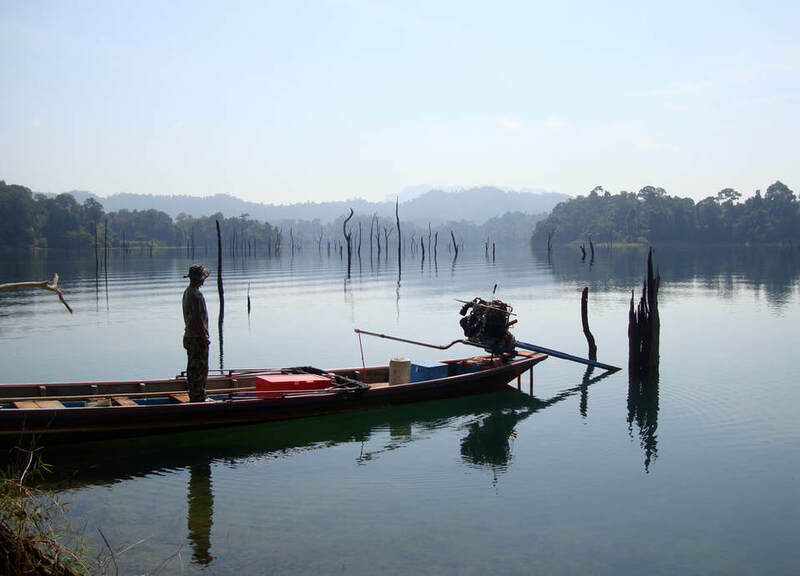 In 1987 the Ratchaprapha hydroelectric dam inundated southern Thailand’s largest tract of lowland forest, creating the 165 km2 Chiew Larn reservoir and transforming 100 forested hilltops into islands. To learn how the avian community has coped, habitat surveys and point counts were completed on 23 islands and 24 nearby mainland peninsulas. The forest structure on islands and mainland did not substantially differ. Although the mainland and islands had similar species richness, the islands held 27% less Shannon’s diversity. Compared to a species pool compiled in less disturbed forest upstream, the mainland was depauperate and experienced collapse among ground-foraging babblers, middle-storey sallying insectivores, mixed-species foraging flocks, and Sundaic species. In addition to the flooded lowlands, 61 km2 of degraded mainland edge habitat surrounded the reservoir. Designation of protected areas is usually biased towards specific habitats and species. A 2016-study of the Indo-Burma Hotspot identified bias in terms of representation among vertebrate taxa, and suggested the need to protect 21% of the entire Indo-Burma hotspot, from the 16% currently under protection. Moreover, a recent study in Thailand reveals a bias of the occurrence data among taxa (Birds VS others taxa) and regions (Southern and Western VS other regions) which is quite critical as it is baseline information for protected areas designation. To reduce this data bias, unpublished data can be another source that should be incorporated especially for less studies species group. Meanwhile, more basic surveys in the gap areas should be promoted to increase overall spatial coverage. 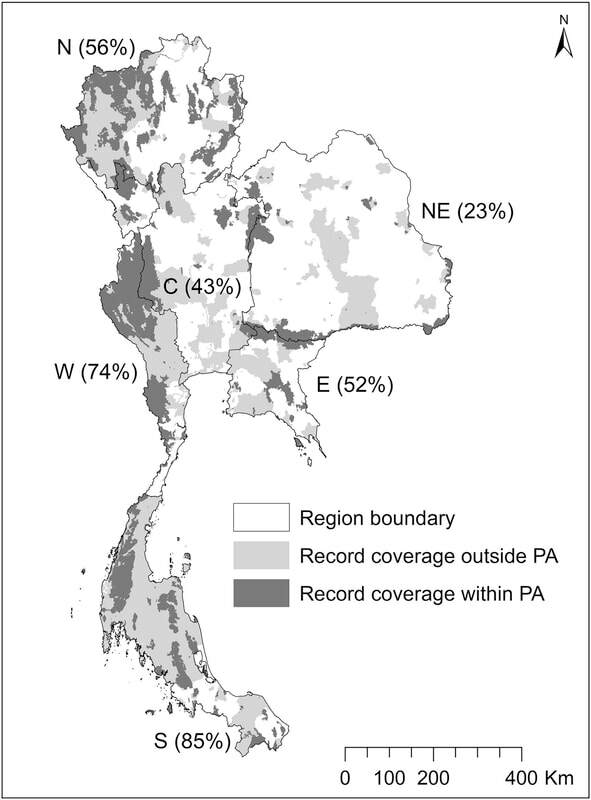 Coverage of species records inside and outside protected areas for each region of Thailand. N refers to the northern region, NE northeastern, W western, C central, E eastern and S to the southern region. Numbers in parentheses indicate percentage of area having species records obtained in the recent study within each region. The figure demonstrates the bias of the coverage toward southern and western regions, while species occurrence data from northeastern Thailand are the least available. In this first ever quantitative study of the Saola (Pseudoryx nghetinhensis), we assessed the characteristics of its macrohabitat and microhabitat using location data obtained from local people. The observations support previous work that Saola is likely a mid-elevation species (~600-1100 m). It was more likely detected in areas with higher abundances of streams; however, streams were also associated with human travel routes. Saola were more frequently encountered in primary forest but occasionally observed in secondary growth. Most encounters were on animal trails. This information may assist in searching for other possible sites, however additional camera-trap surveys are now urgently needed as the size of the remaining population is probably tiny. Is Edwards’s pheasant already extinct in the wild? 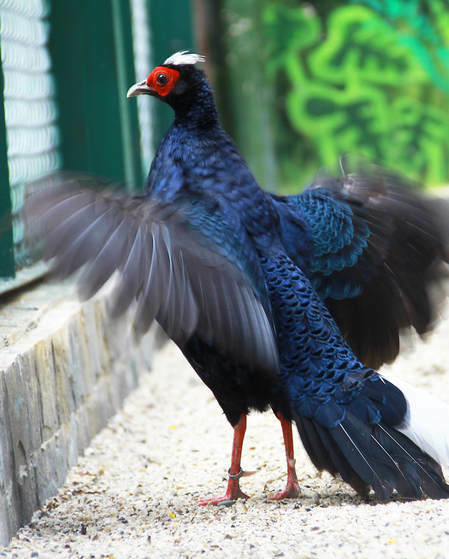 A recent estimate based on the few available location records showed that Edwards’s pheasant (Lophura edwardsi) could be beyond the extinction threshold. As for other species believed to have the highest probability of extinction, this species was among the most poorly known making it extremely difficult to decide how to spend scarce resources. All available information were gathered and used to assess, objectively, if the species persisted in the wild and determine what future conservation actions (i.e. survey) should be and where they should be targeted. The proposed approach will assist conservation planning / management when focusing on poorly known threatened species where a very small data set is available. 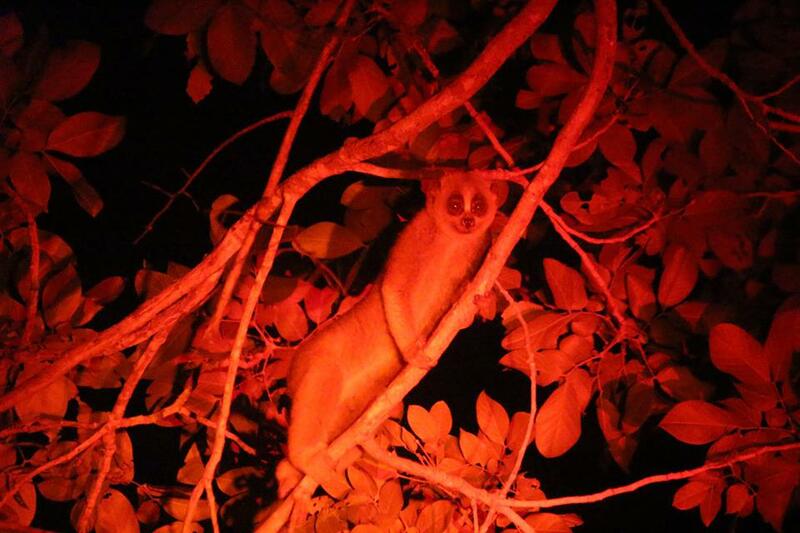 All identified groups of white-handed gibbons, pileated gibbons and mixed-species, and hybrid groups at a major area of their contact zone in the Khlong Sai Area (Khao Yai National Park). The paired circles indicate the bonded female and male species in each group. Ranges of Hylobates lar (purple) and H.pileatus (green) are depicted using inverse distance weighting interpolation. No evidence was found of niche differentiation between lar and pileated gibbons at their contact zone despite being strongly territorial to each other. Contact zones between related species are rare ecological systems fundamental to comprehend species coexistence, which unfortunately have mostly been lost by deforestation. The study showed that the contact zone seems to be unstable and maintained by dispersal inward from parental species. The low numbers of hybrids suggests they are less fit and have trouble expanding into parental areas. However, while territoriality should constraint hybrid movement, it would not necessarily present a barrier to introgression into contiguous populations of the opposite species. A recent survey of Hala Bala Wildlife Sanctuary in southern Thailand showed a major decline in a key Great Argus (Argusianus argus) population. The 2014 study was undertaken during the same season and precise locations previously surveyed in 2001-2002. Results indicate greater than 35% decline in mean abundance, with a general shift of male abundance away from forest edges. The cause is believed to be related to relentless human encroachment and continued habitat loss to palm oil production. This is rather distressing as the area sits towards the northern extent of the species range and no data exists for other Thai populations in light of similar deforestation trends. Results suggests an upgrade is required in the species conservation status. Camera trap photos showed leopard moving frequently near the campground during the day, when free from human disturbance. Credit: D. Ngoprasert, 2003. 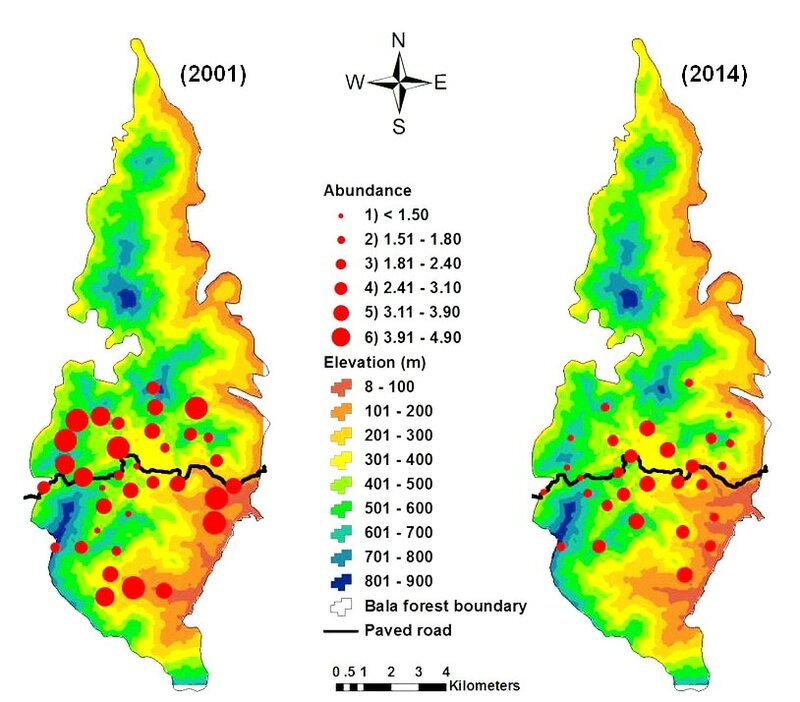 Ranging behaviour of threatened leopard﻿ (Panthera pardus) inhabiting Thailand’s Kaeng Krachan National Park changed dramatically when the park was forced to close due to flooding. The park receives over 100,000 visitors annually. Although the overall species density was unchanged prior to and after closure, in the absence of tourist activity, leopards tended to move more frequently (detection rate increased by 70%) and they became more active during daylight hours. This is likely to improve heath, reproductive success, and survival. Administrators of protected areas could consider seasonal closure of parks to alleviate human pressure on leopards and other carnivores. Data on human disturbance and abundance of large carnivores and prey are recommended as key indicators for long-term management. 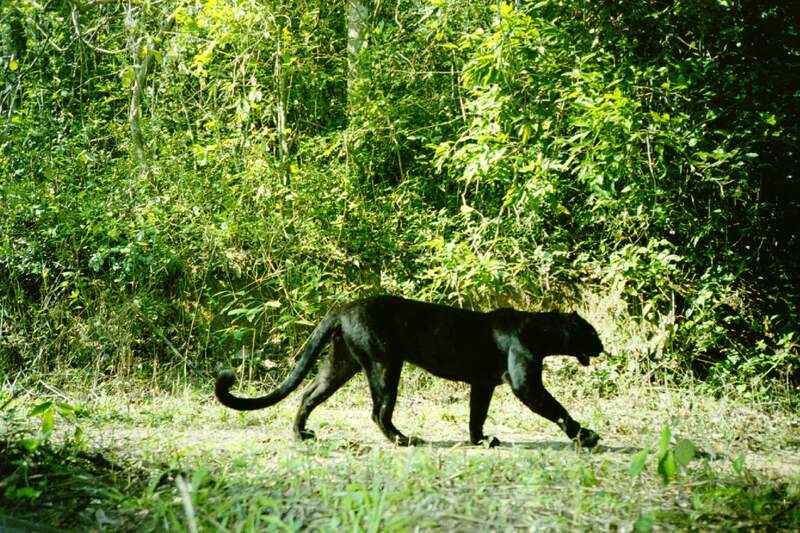 ​Camera trap data and occupancy analysis has found high levels of illegal human activity in three protected areas of the Sundarbans National Park of Bangladesh - a UNESCO World Heritage Site. Law enforcement in the park is hampered by limited human and financial resources. In this situation, camera traps are a valuable tool for monitoring areas where trespassers congregate. 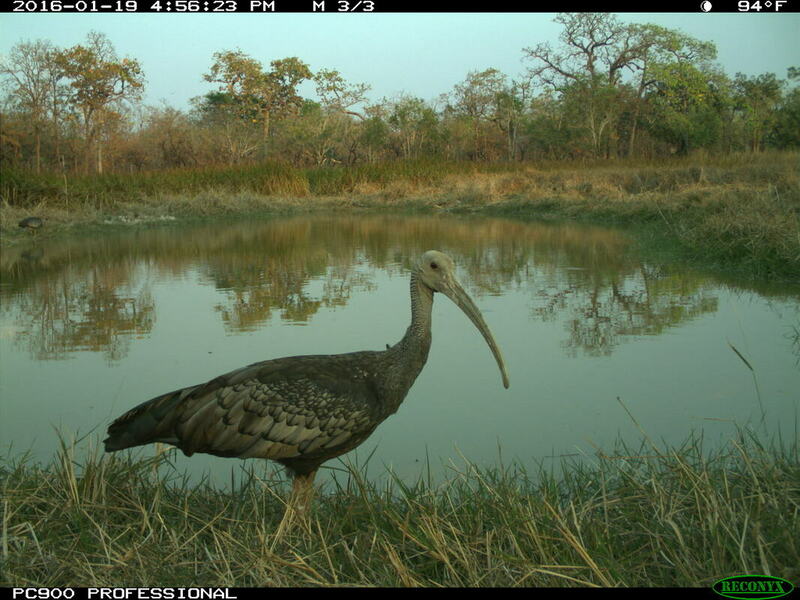 Placed at canal junctions where boats move through the forest, camera-traps have been operating 24/7, thus maximising detection of intrusion by hunters, fishermen, crabbers, and nypa palm collectors. Photos are able to help identify individual perpetrators and their boats - crucial information for enforcement, patrol planning, and overall development of economic activities in the area. Read more on Mongabay.com﻿, Responsible Business, the ATBC website, and download the press release. 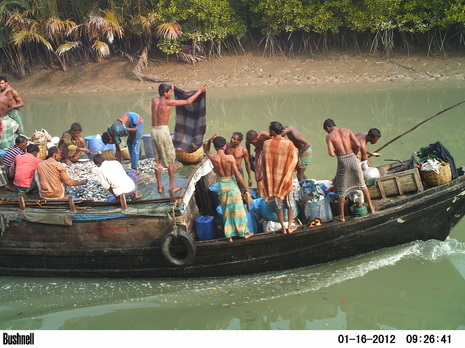 Fishing was the most common illegal human activity detected in the area monitored, carried out with either paddle boats or mechanised trollers as pictured. Credit: A.N.M. Hossain, 2012. ​A semi-provisioned non-territorial macaque troop shows the appearance of territoriality traits, both in ranging pattern and social behaviour, demonstrating that human modification of food availability through provisioning can significantly generate territorial movement patterns in a non-territorial species. Using a novel methodology for primates, characteristic hull polygons were combined with spatial-statistics and analysed over different temporal scales, allowing for analysis of ranging behaviour and space-use patterns of two non-territorial northern pigtail macaque troops, one semi-provisioned, as well as one highly territorial gibbon group. In the semi-provisioned troop home range, core area and daily path lengths were significantly smaller, resulting in a high defendability index and a high site fidelity similar to that observed in gibbons. Moreover, higher aggression was observed during inter-troop encounters. Designation of protected areas is usually biased towards specific habitats and species. A recent study of the Indo-Burma Biodiversity Hotspot, published in Biological Conservation, identifies bias in terms of representation of mammals in protected areas (75%) with threatened amphibians poorly covered (27%). The study demonstrates the need to protect 21% of the entire Indo-Burma hotspot, versus the 16% currently under protection, in order to achieve conservation targets. A window of opportunity still exist to connect fragmented protected areas that would prevent the permanent loss of threatened landscape-level species. This live-caught Stripe-backed Weasel (Mustela strigidorsa), from a village near Kuiburi National Park, extends the known southern range by over 400km. Credit: Kuiburi NP staff, R. Steinmetz, and N. Seuaturien, 2009. The status and distribution of small carnivores in Thailand are poorly documented, even though parts of the country fall within a global core area for their conservation. KMUTT students have initiated and led a multi-agency collaborative effort to assess the conservation status of Thailand's small carnivores, including non-Panthera cats. Comprising camera trap (and other) data from protected areas across the country, records covered over 80,000 trap-nights, collected from 1996-2013. Non-detection of some species that were confirmed as present may indicate that presence may be underestimated using camera traps. Some interesting findings include an extended range of Stripe-backed Weasel by over 400km south. Recommendations include upgraded protection status for several species, undertaking a comprehensive survey of semi-natural wetlands, and the urgent protection of forested coastal wetlands. Larkin Powell from the University of Nebraska-Lincoln and Assoc. Prof. George Gale have recently published a book entitled “Estimation of Parameters for Animal Populations: a primer for the rest of us.” With a foreword by John Carroll, the book offers a simple introduction to the logic behind analyses and sampling design for mark-recapture and other survey methods. It uses straightforward language and visual learning cues to explain to beginners and more experienced practitioners the complicated formulas and statistics that can be effectively used to support conservation efforts. The book is complementary to, and makes reference to, the more advanced resources used in conservation research. An important objective of the book is to make wildlife analytics accessible and affordable to students and wildlife managers in developing countries - it is available for purchase and for download free of charge.